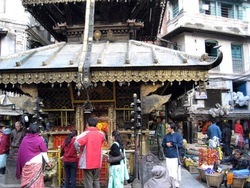 One of the very famous of Goddess Annapurna is situated in one of the equally famous and crowded market place of Ason. Goddess Annapurna refers to the one who is responsible for providing Anna, food grains. 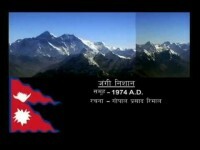 Literary translation of Annapurna is the ‘provider of food’ as Anna refers to ‘food grains’ and purna means ‘complete’. The people of Newar community call the temple as Asvalu Ajima. They believe that if you get her blessing, you will never fail in business. This temple lying in the heart of Ason is made on the basis of Ying principle or the principle of female energy and build according to the tantric philosophy. The main statue of the goddess is built in symbolic form as silver kalash (pot). Both, the Hindus and Buddhists come to this temple to worship the goddess who is also the provider of food for their survival. Besides this, people also come here to make all sorts of wishes from family happiness to successful relationships to successful business. Goddess Annapurna is considered as an incarnation of goddess Parvati, wife of Lord Shiva. According to the legends, there was a time when all food disappeared from the earth and the lives of living creatures were in danger. People appealed to Lord Brahma for help who Brahma consulted with Lord Vishnu and decided to awaken Lord Shiva from his ritual sleep (yoganindra) and give him that responsibility. That is when Lord Shiva invited goddess Annapurna to the earth and requested her for rice which was later distributed throughout the world. It is also believed that keeping a photo of the goddess on the north east corner of the puja room at home will bring divine cosmic energy in your home. The goddess is also known as Danya Laxmi, goddess of wealth. It is often believed that if the goddess is pleased with you, there will never be any scarcity of food in your kitchen or your store will never be empty.